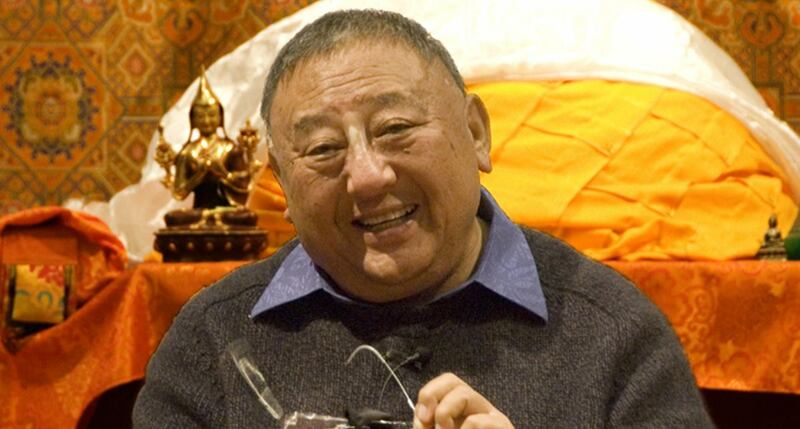 Born in Lhasa, Tibet, in 1939, Kyabje Gelek Rimpoche was recognized as an incarnate lama at the age of four. Carefully tutored from an early age by some of Tibet’s greatest living masters, Rimpoche gained renown for his powers of memory, intellectual judgment and penetrating insight. As a small child living in a monk’s cell in a country with no electricity or running water, and little news of the outside world, he had scoured the pictures of torn copies of Life Magazine for anything he could gather about America. Among the last generation of lamas educated in Drepung Monastery before the Communist Chinese invasion of Tibet, Gelek Rimpoche was forced to flee to India in 1959. He later edited and printed over 170 volumes of rare Tibetan manuscripts that would have otherwise been lost to humanity. Rimpoche was also instrumental in forming organizations that would share the great wisdom of Tibet with the outside world. In this and other ways, he played a crucial role in the survival of Tibetan Buddhism. He was director of Tibet House in Delhi, India and a radio host at All India Radio. He conducted over 1000 interviews in compiling an oral history of the fall of Tibet to the Communist Chinese. In the late 1970’s Rimpoche was directed to teach Western students by his teachers, the Senior and Junior Masters to His Holiness the Dalai Lama. Since that time, he taught Buddhist practitioners around the world. In 1988, Rimpoche founded Jewel Heart, a Tibetan Buddhist Center. Rimpoche was particularly distinguished for his thorough familiarity with modern culture, and special effectiveness as a teacher of Western practitioners of Tibetan Buddhism. Recognizing the unique opportunity for the interface of spiritual and material concerns in today's world, Rimpoche also opened a dialogue with science, psychology, medicine, metaphysics, politics, and the arts. Rimpoche was a U.S. citizen and lived in Michigan. He passed away on February 15, 2017. Gelek Rimpoche's contribution to the preservation of authentic and seminal Tibetan Buddhist teachings within the Gelugpa tradition, for both present and future generations, cannot be overestimated. His Collected Works now include over 35 transcripts of his teachings, numerous articles as well as the national bestseller Good Life, Good Death (Riverhead Books 2001) and the Tara Box: Rituals for Protection and Healing from the Female Buddha (New World Library 2004). The extensive digital archive housing Rimpoche’s audio/video recordings and transcripts is a treasure house of original and authentic teachings from a great contemporary master. Your support to maintain and further develop the electronic audio and video archive, online courses and transcript publication is most welcome. To offer your support or project sponsorship please contact us. Movie Trailer "An American Rimpoche"